One morning, about 20 years ago, Tracy Dixon-Salazar heard a strange sound coming from her daughter’s bedroom. She rushed in to find 2-year old Savannah jerking violently in bed, apparently choking. But when the paramedics came, they couldn’t find an obstruction or anything else to cause her condition. “No one could explain why I had a healthy 2-year-old one day and the next day that was gone,” Tracy says. Savannah was having seizures caused by a severe form of epilepsy called Lennox-Gastaut syndrome (LGS). LGS seizures typically start before age 4, according to the National Institute of Neurological Disorders and Stroke, and there are many types. Most LGS patients experience frequent seizures that do not respond to current epilepsy therapies. And they often have memory problems, learning deficits, developmental delays and behavioral issues. For two-thirds of people with all forms of epilepsy, including Savannah, the cause is unknown. Treatment is even more challenging. “For more than a third of epilepsy patients, including those with LGS, no single treatment or combination therapy can control their seizures,” says Joseph Gleeson, M.D., a leading pediatric neurogeneticist and a professor in the department of Neurosciences and Pediatrics at UC San Diego. Recently, he was named the first endowed chair at the Rady Pediatric Genomics and Systems Medicine Institute, supported by a $2.5 million pledge by Rady Children’s Hospital Auxiliary (see sidebar below). Savannah’s seizures continued — coming fast, furious and often. By age 3, she was wearing a helmet. At 4, her seizures started coming in hours-long clusters. Sometimes the muscle relaxant diazepam could slow them down, but quite often the little girl had to go to the emergency room. The family needed answers, but the medical community had none for them. Medications they hoped might help didn’t help — or made Savannah’s condition worse. Meanwhile, the seizures kept mounting — as many as hundreds a day, every day, for years. 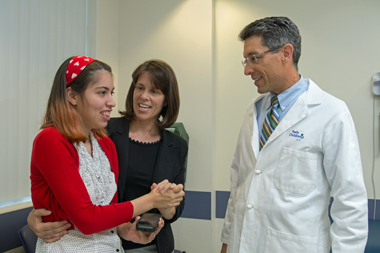 By the time she was a teen, the total number of seizures had reached more than 40,000. Frustrated by a lack of information on LGS, Tracy took matters into her own hands. She started by reading journal articles and taking a biology class. Later, she went back to school and spent 12 years finishing her degree and entering a Ph.D. program, always staying focused on epilepsy and other neurological disorders. Tracy completed her studies while simultaneously caring for a child with uncontrolled epilepsy. Over the years, the family tried more than 26 different treatments: every possible seizure medication, diets, naturopathic approaches, even remedies that made absolutely no sense scientifically. But in the background, a new technology was taking hold: genomic sequencing. After earning her doctorate, Tracy went to work as a postdoctoral scientist for Dr. Gleeson. Savannah’s condition remained serious, and there were times Tracy thought she might wake up to find her daughter had stopped breathing. At Dr. Gleeson’s urging, the lab sequenced Savannah’s exome, the small part of the genome that codes for proteins. Tracy dug into the research process. Faced with a huge slice of information about Savannah’s genetic make-up, Tracy had to figure out which mutations were causing the LGS. There were nearly a mild-boggling million to choose from, but Tracy was able to whittle them down to 25,000. Studying her daughter made the process even more difficult. “It’s just hard to analyze your own child,” Tracy says. Tracy spent 10 months poring over the data, but she found what she was looking for. Savannah had a series of mutations in the genes that code for calcium channels, which help govern electrical signals. The finding was a revelation. “There is no disease described that has combinations of different calcium channel mutations,” says Dr. Gleeson. “We never would have looked for that cause. Identifying the cause didn’t guarantee a treatment, but Savannah got lucky. A heart medication designed to block calcium channels, verapamil, was quickly prescribed. Almost immediately, the drug started working and the seizures dropped dramatically. Now 22, Savannah has been taking verapamil for five years. The drug has had a remarkable effect, reducing her seizures by 95 percent and decreasing nonstop seizures by 99 percent. The damage, unfortunately, cannot be repaired. Still, the payoff has been huge. Tracy no longer worries constantly that her daughter will seize, and possibly die, in the middle of the night. And she continues to work for better epilepsy treatments as associate research director for Citizens United for Research in Epilepsy (CURE). The organization’s Epilepsy Genetics Initiative uses the same genomic tools to find answers for other children. But the ultimate reward has been a more normal life. Joseph Gleeson, M.D., has spent most of his career looking for the genetic mutations that cause epilepsy and other neurological conditions. Now, as the Rady Children’s Hospital Auxiliary endowed chair in neuroscience at the Rady Pediatric Genomics and Systems Medicine Institute, he will have even more resources to continue the search. “We’re going to be sequencing patient DNA to find all sorts of information: the underlying diagnosis; the kinds of medications that child will respond to; and what types of side effects they may be at risk for,” Dr. Gleeson says. That information, in turn, will be used to create clinical trials and improve care. Over the years, Dr. Gleeson’s lab has sequenced more than 3,000 patients, one of the largest groups in the world with recessive forms of neurodevelopmental disease; in recessive diseases, the child inherits abnormal genes from both parents. With this data, the lab has determined that some of these conditions, previously thought untreatable, have potential therapies. For epilepsy – which is not one disease, but many – Dr. Gleeson hopes that emerging genomic tools will decipher the different types of epilepsy, which could lead to new therapies. The Rady Pediatric Genomics and Systems Medicine Institute, established by a $120 million gift from philanthropist Ernest Rady and the Rady family, will embrace these technologies. Donate now and help kids like Savannah!